From her studio in Charlevoix, Michigan, Bonnie Staffel is creating wonderful sculptures and wares. At Vasefinder, we feel very fortunate to showcase the spectacular design of this very important, listed, American artist. Congrats to Bonnie for being the featured artist at the recent Annual Charlevoix Waterfront Art Fair. 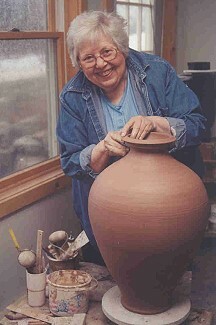 Buy from one of America's great potters! !